I have a question about these new character-agenda cards: since their text always says "Attach to your House card as your only Agenda", would they be considered attachments, agendas or both? I know... I asked because I remembered that rule, but I also thought about the one that says ""When you attach a card to another, it is considered to be an attachment". I hope they clarify it. Agendas are considered out of play for targeting. This card wont be considered an attachment, too, there is no "as attachment" text after attach that changes card type. Both cases were present in CCG, (characters that You could play as agenda), and there are still events that change into attachments in LCG, too. When do these cards come out? They start coming out this month. This guy won't come out until next month though since he is in the second chapter pack. I thought that FFG skipped 1 month between Cycles? Where did you hear that? They haven't skipped months in between any cycle that I know of. Bwahahaha. Staton, I don't think you've paid attention to the game before. FFG misses release dates pretty regularly. I know there have been multi-month gaps between cycles before. I just read that there has been time between basically every cycle except for Secrets of Oldtown and Tourney for the Hand. I've only been around since last year, so I don't know exactly how much time was skipped. One month was more of a hopeful guess. Oh, well yeah I know they HAVE missed deadlines, but it wasn't like it was planned or anything. Although with how frequently FFG drops the ball, it probably should've been planned at this point. With FFG, you should never ever assume that any product will be on time. Trust me. You'll save yourself a lot of heartbreak if you always assume there will be delays. yes, you are right. After being attached it coun't as an agenda, wich makes it immune to wverything, since agendas are out of play. If he is blanked before being killed he would go to dead pile then ? I'm getting this deck. I play Baratheon and Martell and I want this card! I give it a 3. 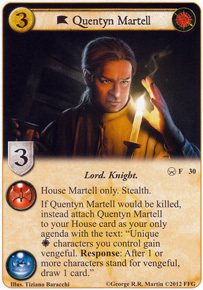 Q: Can you draw cards for Quentyn Martell and Vengeful on the same challenge that he is killed? Short A: No. If he dies during the resolution of a challenge (claim, target killed, deadly) he is still moribund and does not become your agenda in time for that challenge. Long A: This assumes that Quentyn is being killed by MIL claim but there are other effects that could kill him during the "resolution of the challenge" framework action window and the results are the same. Since he is not your agenda until Step 6, the rest of his text doesn't apply until it's too late on the challenge that he dies in. This is why your opponent will typically leave the MIL challenge for last when you have Quentyn out, so you don't get the benefit that round.